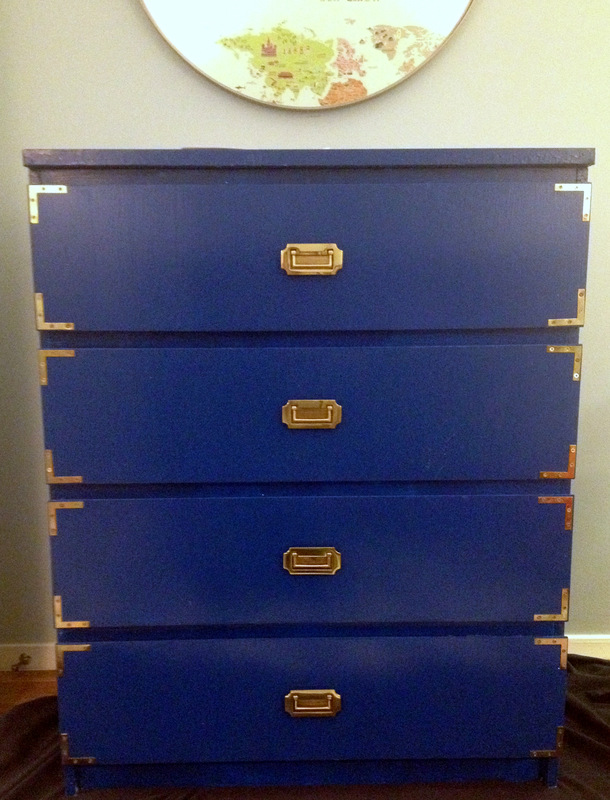 A few months ago I read about a metallic paint line from Benjamin Moore that looked really cool. (A Metal-Like Paint from Benjamin Moore – NYTimes.com.) 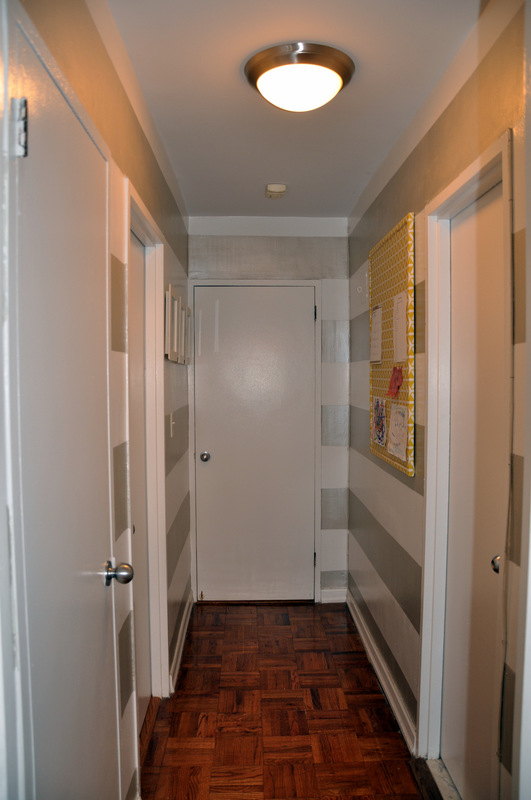 When I was considering revamping my hallway I recalled this article and thought that metallic silver stripes would really punch up the small space. I selected a color called Shyness (PT360) and the man at the paint store told me I needed to select a base color that would compliment the silver otherwise the metallic would not show. 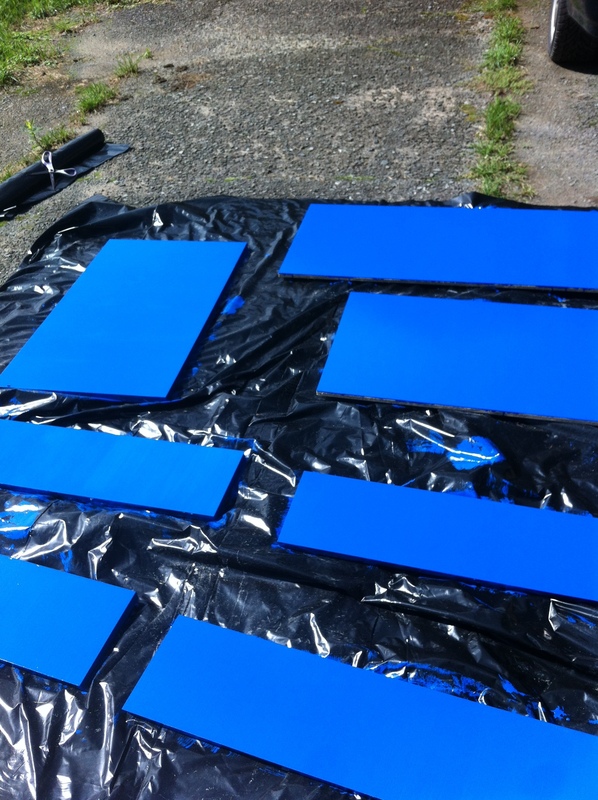 Armed with my paint brushes, rollers, tape, and paint I set off back home to map out my design. 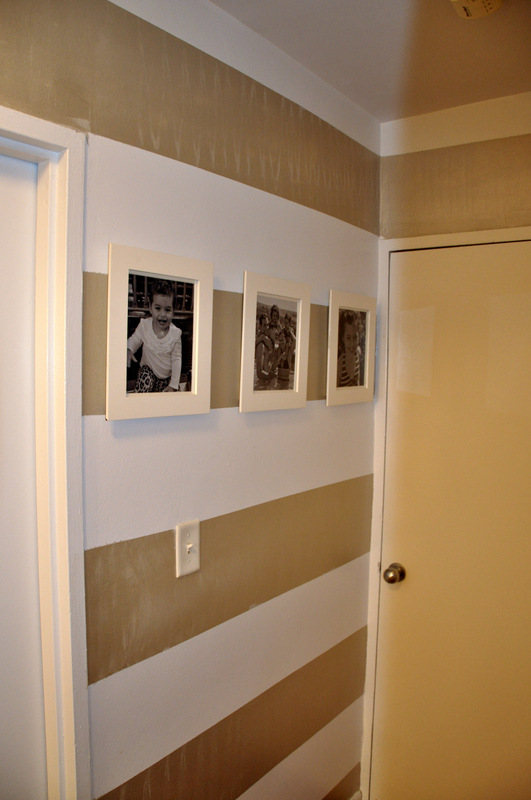 When determining the layout of my stripes I had to consider the fuse box which is located in my hallway. 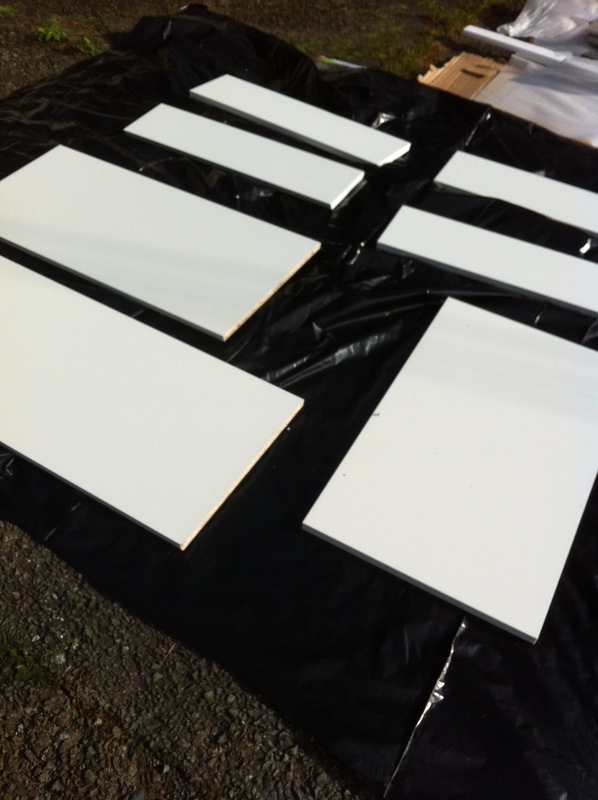 I wanted to leave it white, so I determined the height of my stripes by the size of the box which is 10 1/2 inches. 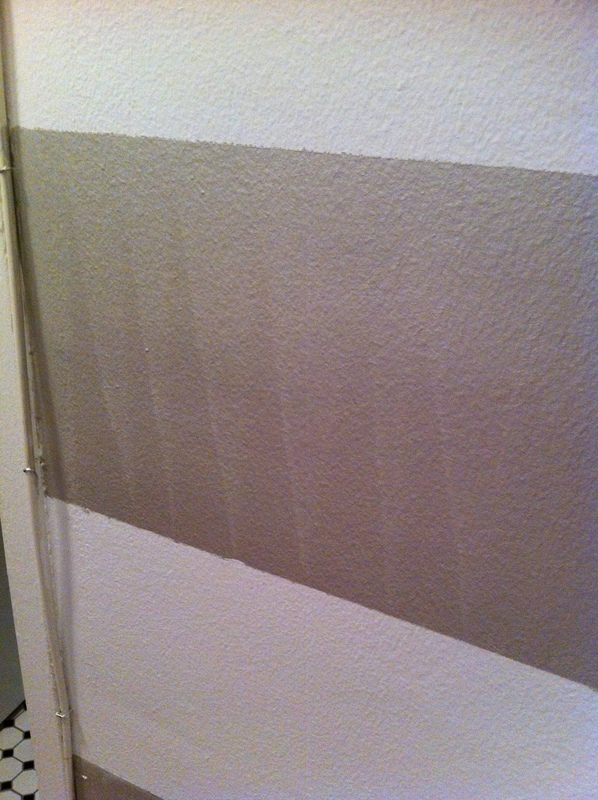 I borrowed a long level from my handyman and measured every 10 1/2″ up and down the wall. Then, using painters tape I positioned the rows of tape either on the interior of my mark (if the space was to be white) or on the exterior of the mark (if the space was to be painted metallic) and made sure the lines were straight with my level. This definitely gets confusing so it’s a good idea to double-check the space in between each row with a ruler once you have completed a section. To make matters even more confusing I had to work around 5 doors and still try to make sure that each stripe lined up horizontally 360 degrees around the space. Make sure you rub the tape in place so you get clean, sharp lines. 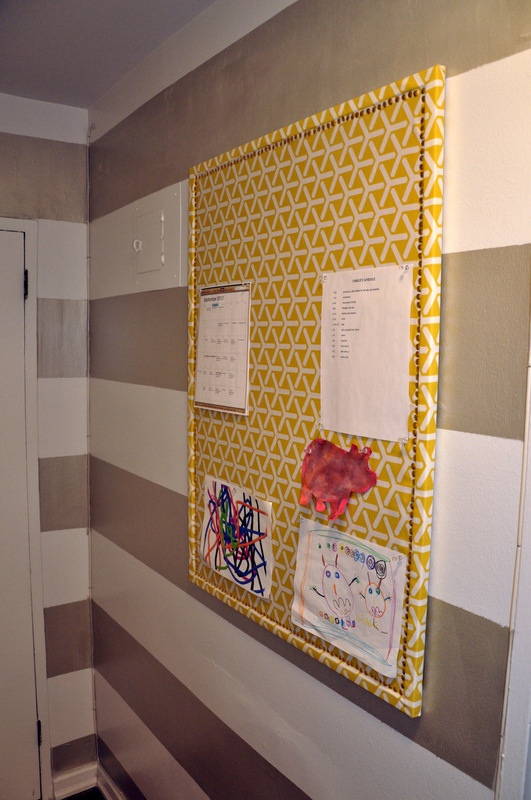 Once your walls are taped you’re ready to paint. 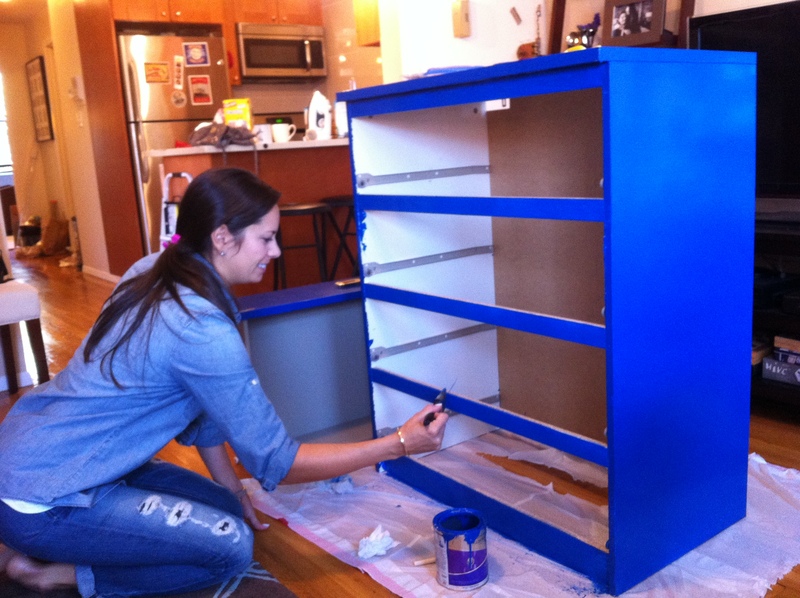 I had to apply the base coat first and two coats of the metallic finish on top. 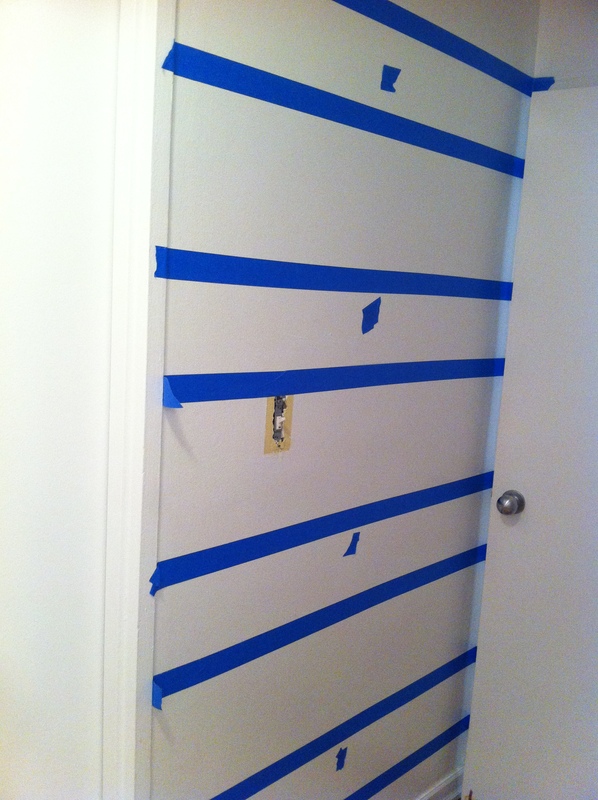 A tip I read about was “to remove the tape immediately after the last coat of paint is applied, while the walls are still wet. 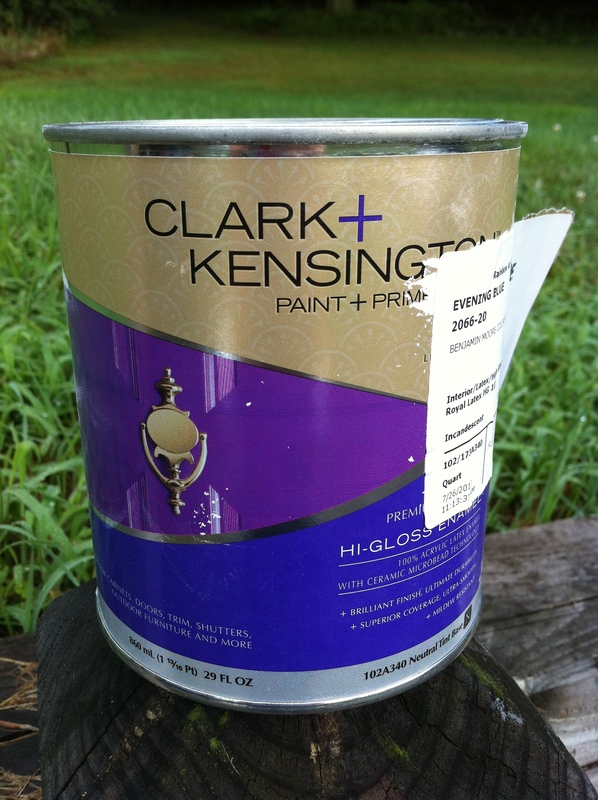 Waiting until the paint has fully dried may cause peeling and uneven lines”. While I followed those instructions I still had some paint that bled from underneath so once everything was dry I had to go back with a small paint brush and touch up some of the lines. It was very frustrating since I had spent so many hours taping to begin with. Also, since this is an apartment rental the walls are not in very good condition and are not very forgiving. If you were going to attempt this paint in a well-lit area you must make sure the walls are skim coated prior to painting. 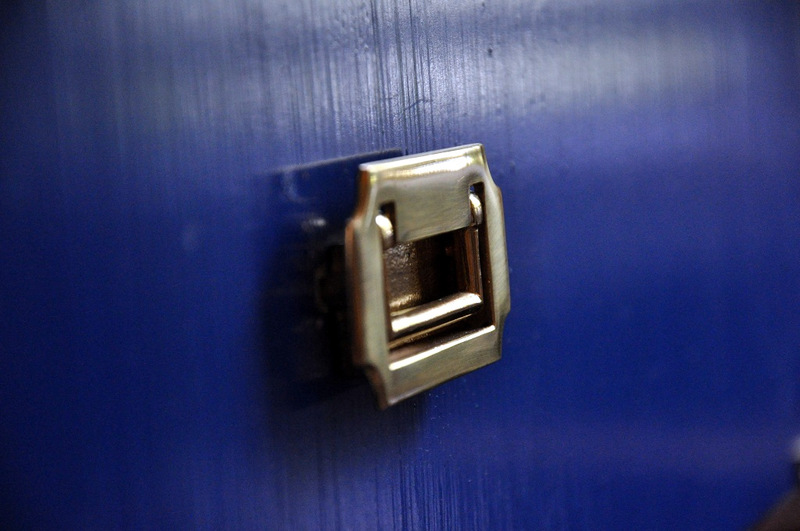 Every crack, hole, or minor imperfection becomes glaringly obvious. While in theory this project seemed like a good idea the end results were not what I hoped for. 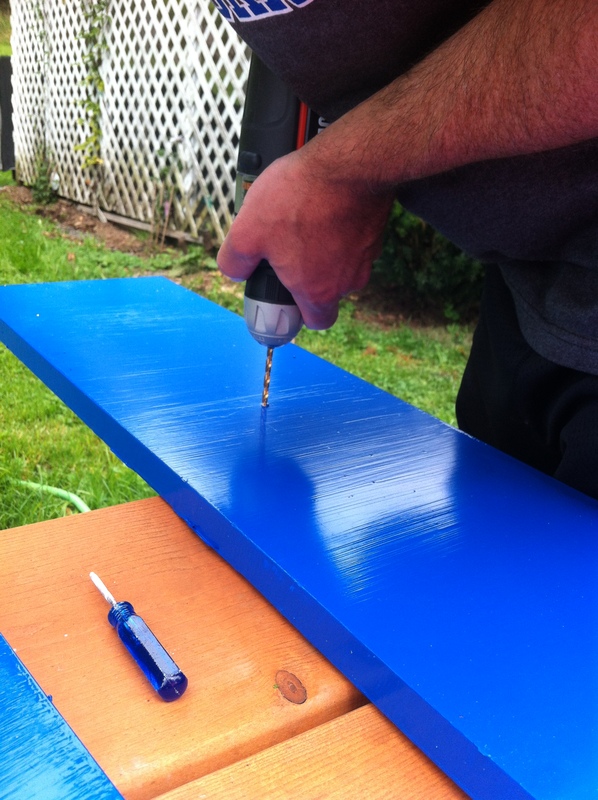 Has anyone used a metallic paint and achieved a smooth finish? Since I did all the taping myself (except for the top row which I had to enlist my husband for) it took about 7 hours and the total cost was around $75. After painting I added a few black and white family photographs, and covered a bland cork board in fabric (more to come on this project). I think the space looks better than it did before, but the roller marks still bug me. Does anyone have any tips on how to fix this?